Interwatches Blog | Under development. Lost is the American serial drama television series that follows the lives of plane crash survivors on a mysterious tropical island, after a commercial passenger jet flying between Sydney and Los Angeles crashes somewhere in the South Pacific. Season 6 premiered on February 2, 2010, at its new timeslot of Tuesdays at 9:00 pm in the US and Canada and will feature 18 episodes. The sixth season follows two timelines, each an outcome of the detonation of a hydrogen bomb in the previous season finale. 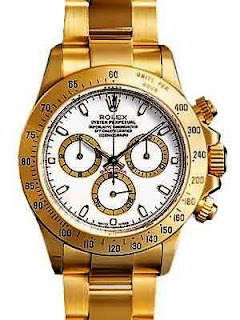 One of the series’ main characters, Jin-Soo Kwon, was given, at the beginning of the series, two identical Rolex Wristwatches; two Rolex Daytona. Two identical gold Rolex watches were given to Jin by Mr. Paik to deliver to business associates in Sydney, Australia and Los Angeles, California. Jin delivered the first one, but crashed on the Island before he could deliver the second one. Michael found the remaining watch on the beach and decided to wear it. When Jin saw this, he attacked Michael. After Sun explained to Michael why Jin acted the way he did, Michael gave the watch back to him. After the second raft was launched, Jin returned the watch to Michael. There are two series of the Rolex Cosmograph Daytona. The original series, produced in small quantities from the early 1960s to the later 1980s, has a four-digits model or reference number, for example the reference 6263. This original series eventually became iconic[vague] but in very short supply in the early 1990s, which led to a second series to meet demand. The second series has a six-digit reference number, for example reference 116520. The new six-digit Daytonas are certified, self-winding chronometers with chronograph functions. Rolex was, and remains today, a sponsor of the 24 Hours of Daytona race at the time, and named its chronograph watch after that famous race. Due to its limited production and iconic status, the four digit series Rolex Cosmograph Daytona is considered a rare watch to own. 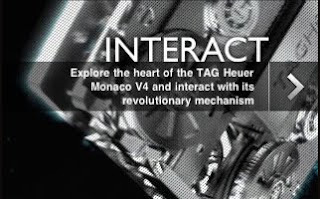 After 150 years of innovations that changed the world of watchmaking, TAG Heuer is proud to introduce the Monaco V4, the first watch ever using belt transmission. Considered as a marketing bluff a few years ago by the experts themselves, this revolutionary time piece has now become an outstanding reality. Enjoy fascinating close-up views of the model. Watch exclusive interviews of the pioneers who made this dream possible, more than 30 minutes of included videos. 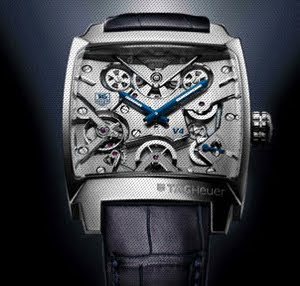 TAG Heuer Watches at Interwatches! The giant OMEGA Countdown Clock approaches the fantastic Opening Ceremony of the Olympic Games today in Vancouver. OMEGA’s professionals are actively involved in preparations for the competition where, for the 24th time, the Swiss specialists will serve as Official Timekeepers at the Olympic Games and also -on the 12th of March- at the Paralympic Games. At OMEGA’s first timekeeping assignment for the Olympic Winter Games in Garmisch-Partenkirchen, Germany in 1936, a lone OMEGA technician brought 27 stopwatches which were used to time each event at the Games. Seventy years later in Turin, the watchmaking company deployed 208 professionals – 127 timekeepers and 81 data handlers – armed with 220 tons of equipment. At the Vancouver 2010 Olympic Winter Games OMEGA mobilises the largest timekeeping contingent in the history of winter sport. The Games will take place over a 17-day period beginning on the 12th of February when, more than 5,500 athletes and officials from more than 80 countries, will make it the largest Olympic Winter Games ever. The Paralympic Winter Games, for which OMEGA is also Official Timekeeper, start on the 12th of March and will continue for ten days. The Games’ organisers anticipate that the Vancouver 2010 Paralympic Winter Games will attract 1,350 athletes and officials from more than forty countries. The Vancouver 2010 Olympic Winter Games will attract an estimated three billion television viewers worldwide. More than 10,000 members of the press are planning to attend and it is projected that the vancouver2010.com website will be visited 75 million times. This year, for the Vancouver Olympic Games, Omega has launched a brand new limited Seamaster edition of 2,010 timepieces in order to commemorate the sport event and will also make the colorful attraction of the Canadian’s Vancouver 2010 Olympic Games. The metallic red bezel pays a tribute to the Canadian flag, and the Olympic Colored Rings attached as counterweight to the seconds hand. As for the specifications, the Omega Seamaster 2010 is powered by a 2500 movement that employs the reliable and high-performance Omega Co-Axial escapement, it is 300 m water-proof. It is also equipped with a helium valve, a screw-down winding crown, and features the robust and stylish “Bond” Seasmaster stainless steel bracelet. The case has the Vancouver 2010 Winter Olympic Games logo engraved on its back, the unique series number, and the Ilanaak symbol of the Olympic Games. The ninth British Classic Yacht Club (BCYC) Cowes Regatta (Isle of Wight, UK) will join the prestigious Panerai Classic Yachts Challenge Circuit (PCYC) from 2010 as part of a three-year sponsorship deal signed this month. The BCYC Cowes Regatta whichwill take place from Sunday 18th to Saturday 24th July 2010 will be the first UK event to join the Panerai Circuit. 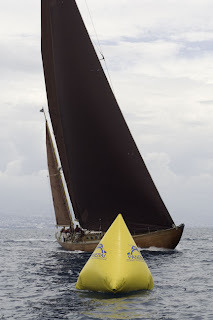 2010 will be the sixth edition of the Panerai Classic Yachts Challenge and marks the largest and most renowned classic yacht race in the world. Each year the Challenge draws yachting enthusiasts from around the globe and the most highly regarded Classic Yachts sailing today, in 2009 over 350 yachts and 1,500 crews competed overall in the Circuit. The event will now be known as The British Classic Yacht Club Panerai Cowes Regatta – The BCYC Panerai Cowes Regatta is held in the tidal waters of the Solent, a stretch of sea separating the Isle of Wight from the mainland of England. The highlight of the week’s racing is the Classic Round the Island Race, starting on the Royal Yacht Squadron line before racing the 60 mile course either East or West around the Isle of Wight. 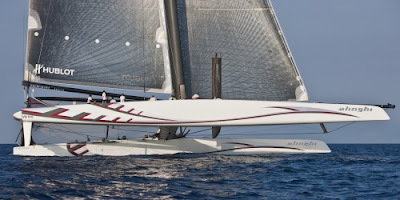 The 2010 Round the Island race will be held on Tuesday 20th July. 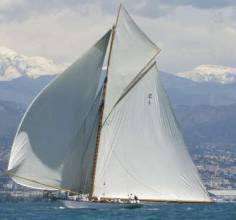 The BCYC and Officine Panerai envisage that the 2010 event will be the largest Classic Yacht Regatta in the UK since the Americas Cup Jubilee Regatta in 2001, and are predicting that over 65 yachts will compete. Black is the keynote here, variously interpreted in the steel case subjected to an ultra-resistant carbon-based treatment; the unidirectional rotating bezel; the large screw-locked crown and non-slip pushpieces; and on the dial base creating a striking backdrop for the white luminescent hands, hour markers and red-rimmed counters. Its original, technical and powerful appearance makes the Avenger Seawolf Chrono Blacksteel limited edition an unmistakable standout model among diver’s watches. But its greatest feat is hidden inside its case, thanks to its magnetic pushpiece system. This exclusive Breitling patented device serves to activate the controls through the metal of the case, without any direct mechanical contact. This means that whereas most chronographs cannot be used when diving, the Avenger Seawolf Chrono is the only instrument of this type to be watertight and fully operational at a record depth of 1,000 meters (3,300 ft). To accompany professionals to great depths in complete security, this extreme chronograph has been equipped with a decompression valve and a glareproofed sapphire crystal guaranteeing optimal readability in all circumstances. Its SuperQuartz™ caliber – also exclusive to Breitling – ensures a level of accuracy ten times superior to that of standard quartz movements, enabling it to measure times to within 1/10th of a second complete with split-time indications. The Avenger Seawolf Chrono Blacksteel, issued in a 2,000-piece worldwide limited edition, is available on a – naturally black – Diver Pro rubber strap or on a perforated Ocean Racer strap. In a nod to Breitling’s special ties with aviation, its inner bezel ring is adorned with a windrose serving to memorize a course – both underwater or in the air. 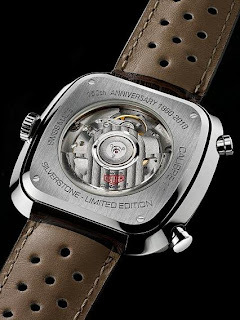 According to what Swiss watchmaker TAG Heuer revealed, it will retail for about $6,500. Admired and claimed by Heuer fans and watch fans alike, the TAG Heuer Silverstone Wristwatch is getting re-released this month, February 2010, in a limited edition of 1,500 models of each color. The new Silverstones will be released in brown or blue versions, with perforated alligator straps and an updated Caliber 11 movement with a Dubois-Depraz module. 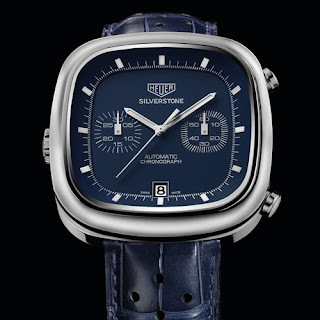 TAG Heuer Silverstone Wristwatch was first introduced in 1974 so as a way of emulating the curvature of the famous English racing track, with a design inspired by the distinctive square case of its predecessor, well known TAG Heuer Monaco Watch. 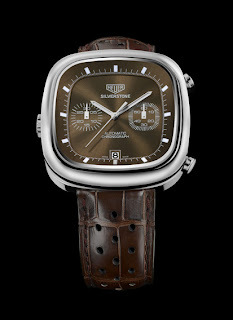 Back in ’74, the Silverstone timepiece featured the Chronomatic Calibre 11, the first automatic self-winding chronograph ever made. For its re-issue, Silverstone is now powered by an updated version of the Calibre 11 with Dubois-Depraz module. 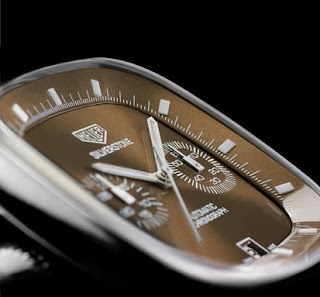 In order to celebrate TAG Heuer‘s history, it houses the brand’s original Heuer logo, which is flanked on the dial by two silver counters at 3 and 9 o’clock. Stainless steel pushbuttons at 2 and 4 o’clock, a hand-applied date window at 6 o’clock and curved, sapphire crystal with double anti-reflective treatment complete the watch’s look. 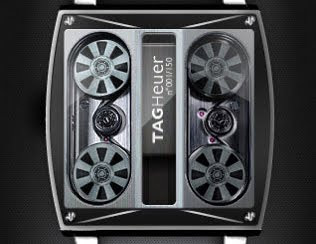 Check our TAG Heuer Watches Gallery! Roger Federer was born on August 8th, 1981 in Basel, Switzerland. Since he turned a pro player in 1998, he has won 681 matches and lost only 162. Only in 2010, he has won 4 matches at Melbourne Park, reson for which he became -on February 1st- the Grands Slam Champion, price he has achived sixteen times. 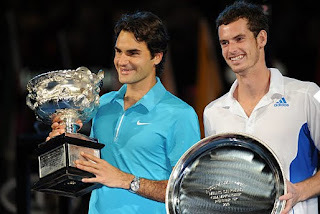 The Australian Open tournament is the first of four Grand Slams. It establishes a rhythm of victory with every hard-fought point in which the bar of success is always high and so champions must leave all of it on the court. 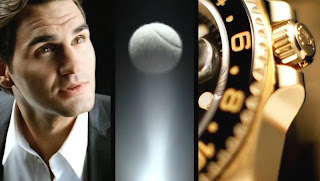 Roger Federer is Rolex’s Ambassador for the Day Date Wristwatch, a leader timepiece. The Oyster Perpetual Day Date watch is the ultime –according to Rolex Official Web Site– piece chosen by the world’s elite. It gets to be the very essence of luxury. 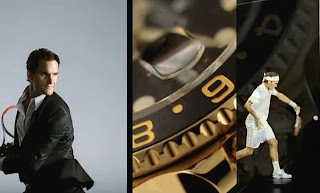 Roger Federer was chosen as the Day Date Ambassador because que represents the spirit of this luxurius timepiece. As a number one and dedicated player, he was the first to reach 16 Grand Slams titles. Model of inspiration, a non finished icon, he is called the greatest player of all times. According to Roger’s Official Web Site, “his 16th grand slam titles has secured him some space at the top of the ATP world ranking. Quite a few changes have occurred directly behind him, though: Novak Djokovic (2) and Andy Murray (3) have moved up, Rafael Nadal has fallen to fourth place”. It is well known that Roger reached 268 weeks as number one of the ATP ranking. And our champ certainly is on track to breaking much more records too! The exquisitely brilliant Rolex Day-Date belongs to the Oyster Perpetual collection of the Rolex line. This perfect wristwatch is well known for being as perfect as it looks, not only for its aesthetic but also for the way it works. The Rolex President or Day-Date, as it name suggests, not only displays the date of the month but also the day of the week in 26 different languages. This wristwatch comes fitted with a certified chronometer and the 36 mm radial that add to its charm. The self-wound watch is also waterproof to 100 meters leaving its other contemporaries far behind. Nothing takes the heart and the soul of the wearer the way the platinum and diamond finish of this watch does. 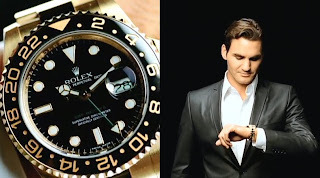 Rolex President or Rolex Day Date, it is the one chosen by many celebrities. Stars like: actress Katherine Kelly Lang, the actor Benjamin Bratt, Liv Tyler, theatre actor Sam Shepard, filmmaker Martin Scorsese, actress Clea DuVall, actress Dana Elaine Owens Queen Latifah, Carmen Electra and Andy García, between many many others. Hublot proudly presented, in New York, Veronica Varekova as the ambassador for the African Wildlife Foundation in order to embody the feminine expression of Hublot’s spirit as the top model and the watch brand share the same values and also their passion for extraordinary adventures, as well as a huge concern for our environment. Unique, sporting, committed and vibrant, Veronica Varekova is now the ambassador for a watch brand that symblises fusion, innovation, vitality and creativity. Great lover of art, deeply involved with the African Wildlife Foundation after climbing Mount Kilimanjaro, the “roof of Africa”, she developed a profund appreciation for extreme environments and their wildlife, getting in contact with the urgent need of protecting and preserving them. The foundation, now active for 50 years, chose her as it’s ambassador in order to promote and help to support their initiatives which aim to protect communities, wildlife, species and landscapes of Africa. 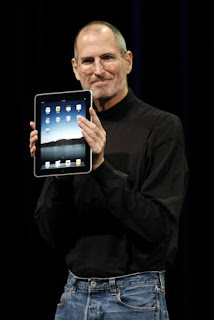 Apple finally announced its iPad tablet computer last week, a magical, revolutionary and ambitiious product which price is just unbelievable. iPad keyboard: a huge and bulky version of the iPhone keyboard, but with much more room between keys making easier and faster writing quick text, such as e-mails or chatting. It will also work with Bluetooth keyboards and, also, Apple will sell a charging dock with a built-in keyboard, even the on-screen one is more than enough to work and write. It’s software: iPad will virtually run all iPhone applications without modification, meaning it’ll work with more than 150,000 programs on the day it ships. 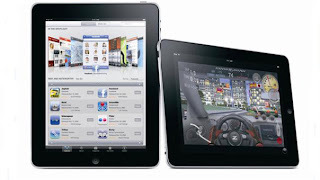 Even though it doesn’t feature a camera or support for Adobe’s Flash technology and only Apple’s programs can run in the background (making possible listening to music while browsing the Web) and all applications run only in full-screen mode, they are not enough reasons for not giving iPad a try. Even though it comes with a splendid photo viewer, it doesn’t have a USB port or memory-card slot, there’s no way to print from the device. What about price? Even it was expected to run $1,000 or so, iPad starts at $499 for the version with 16GB of solid-state storage and no 3G broadband, and tops out at $829 for one with 64GB of storage and AT&T 3G. iPad’s most impressive thing is that Apple came up with a user interface optimized for a touch-centric, no-keyboard computer. Comparing to netbooks, the ones that have bought one in the past as a secondary computer will buy an iPad instead, specially if they’re primarily interested in consuming music, movies, e-books and Web pages. Apple announced a second-generation iPad in 2011 that fixes most of the biggest gripes and packs more features at a better price. The new Breitling Chronomat B01 is now available as an application for the iPhone and iPod touch, It offers descriptions, technical data, video and 360º images of the match. It is also equipped with a configurator to customize the model. If you desire the real thing, the point of sale locations/tracking system will track down the nearest Breitling dealer. Click here to have a 360º look at the wristwatch! 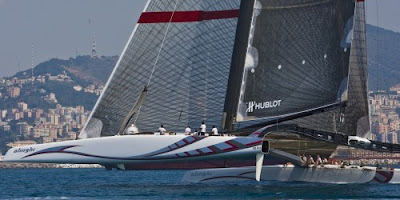 Alinghi, Duj defender of the 33rd America’s Cup, is proud to announce Hublot, the Swiss luxury watchmaker, as a team sponsor for the 33rd America’s Cup. Both brands share many common values, like their constant chase of precision and excellence, or their approach to developing technology to a maximum level. 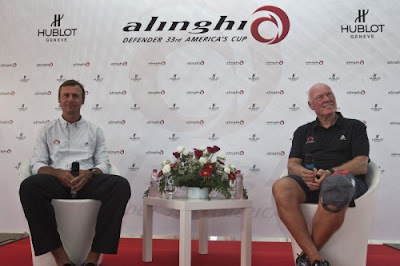 Alinghi is currently training in Genoa, Italy, before transferring the team to Ras al-Khaimah, UAE, in the autumn to continue preparations towards the 33rd America’s Cup which starts on the 8 February 2010. “Bode Bang”, created by Hublot for the legendary champion of the skiing world. Hublot has today announced its partnership with the Alpine ski world championships and the Nordic ski world championships in 2011. The watch brand is reinforcing its involvement with the world of skiing. Already partnered with the enfant terrible of skiing, the American Bode Miller, Hublot is also sponsoring Dario Cologna, the best Swiss cross-country skier ever. The enfant terrible of skiing and world champion in all disciplines in 2008, has had a Big Bang named in his honour. The partnership between the watchmaking brand and Bode Miller came about when the skier visited the manufacture’s workshops. Fascinated by the expertise and meticulousness of the watchmakers, he set out to craft his own watch. His meeting with Hublot CEO Jean-Claude Biver led to an immediate mutual understanding. Both passionate, direct men with an expressive and unconventional manner of speech, they quickly found a host of shared values. The talented, feisty and determined skier, and the inventive, exceptionally energetic boss both demonstrate great generosity through their involvement in supporting humanitarian causes. The creation of the Bode Bang presented today is the fruit of this bond: together, they decided to divert some of the watch’s royalties to the Turtle Ridge Foundation, founded by Bode Miller and his family in 2005 (www.turtleridgefoundation.org) to share his success with those less fortunate in life, an ambition equally dear to Jean-Claude Biver and Bode Miller. PLACE YOUR SAINT VALENTINE’S OFFER! 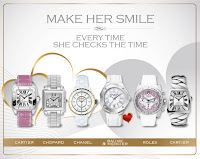 Have a look at our great variety of men and ladies watches selected for Saint Valentine’s day! Cartier Must 21 collection features more than unique and outstanding watches, it is also an icon of perfection highly distinctive as a ”modern classic” in Cartier’s world. Between the many models under Cartier Must 21 name, we can find the Ref. W10110T2. This Cartier Must 21 Ref. W10110T2 has a silver grained dial with a stainless steel minuterie on its inner bezel and Roman numerals with silver grained hour markers outside on its fixed bezel. This Ref. 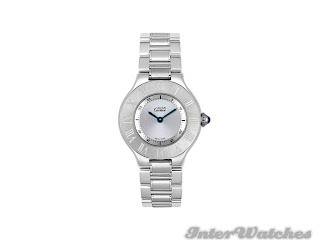 W10110T2 also has sword shaped blued steel hands combining with a blue sapphire cabochon. This combination, of steel and silver, makes a very sleek and stylish modern day watch. Cartier Must 21 Ref. W10110T2 is one of the most peculiar and interesting designed watches. It equilibrates sophistication with contemporary style all blended in one. Since their creation until present, Cartier collections have remained through the centuries because of their magic. This Must 21 Ref. W10110T2 combines this historical Cartier design with an updated modern style. During Jan 18th till Saint Valentines anniversary, Interwatches.com presented a once in a life possibility, making your own offer. Place yours!